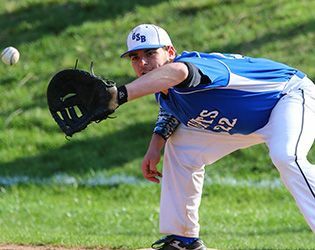 The varsity baseball squad was the first in the program’s history to advance to the sectional finals of the NJSIAA Non Public B South Tournament. In addition, the team advanced to the quarterfinal rounds of the Somerset County Tournament and the NJISAA Prep B Tournament. Finishing out the year 11-1 in the league and 19-11 overall, the Knights toppled some tough opponents, often by wide margins, and stayed competitive throughout the season. For the season opener at home on April 5, the team posted a decisive 13-1 victory over Manville. Leading the offense were Cameron Miller '17, who went 3-for-3 with two RBIs. On the mound, Evan Druskin '17 pitched four innings, scattering four hits and striking out six. On April 8, the Knights defeated Bernard’s High 2-0, with ace Miller earning the complete-game shut-out. On April 11, the Knights enjoyed a 10-0 win over Oratory Prep on the road. Leading the offense were Ryan Chestnutt '16, who went 2-for-4 with two RBIs, and James Raia '16, who went 2-for-4 with three runs. On the mound, Chestnutt gave up only two hits over six innings. The next several outings bought a mix of wins and losses, but the team ended April with five wins, posting victories over Belvidere at home (9-6) and on the road (11-2), over Bridgewater Raritan (8-1) and Manville (20-4). On April 30, the team defeated archrival Pingry 6-0 in the second round of the Somerset County tournament. On the mound, Miller gave up only four hits over seven innings to help the Knights to the shutout. RBIs came from Chestnutt, A.J. Donofrio '19, Dan Sivolella '16 and George Stiuso '16. The winning streak continued into early May, with victories over North Plainfield on May 3 and Pingry on May 5. After a mix of wins and losses in mid-May, the Knights mounted an impressive run in the NJSIAA State Tournament. The team defeated Roselle Catholic 7-0 on May 26 in the opening round. Stiuso pitched a complete-game shutout, allowing only seven hits. On offense, Sivolella led the charge, posting three RBIs and two runs. On May 31, the team defeated Rutgers Prep 6-1 in the sectional quarterfinals. Leading the scoring were Donofrio, who went 3-for-4 with three RBIs, and Neil Ianiello '16, who went 2-for-4 with three RBIs. In the sectional semifinals, the Knights recorded a dramatic ninth-inning 2-1 win over Holy Spirit. In his final pitching appearance for Gill, Stiuso allowed only five hits and one run over the complete game. Looking ahead to next spring, the team will be without the talented lineup of this year’s seniors: Chestnutt, James Grant, Ianniello, Andrew Noll, Raia, Sivolella, Stiuso and Matt Taylor. Among the rising seniors, Miller will be expected to take the lead in pitching, backed by the talented Druskin who earned wins over Bound Brook and Manville this year. Cameron Gateman will also play an important part of next year’s offense and the team looks to expanded contributions from Ryan Fucci, Jack McMahon and Tyler Starr. Boding well for the future of the program, Ryan Morash '18 and Donofrio will be returning to the field and are expected to remain important contributors to the team’s offense. The Knights also look forward to the continued contributions of rising juniors Scott Begane, Joe Johnson and Anthony Lake, as well as rising sophomores Mike Giammarino, Brian Neville and Mark Rusas.